Have you ever thought about whether your hair growth cycle is affected by the various seasons of the year? 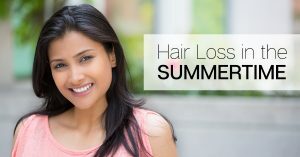 Many people do and feel that they lose more hair during the summer season, while other people feel they grow more hair during warmer weather. At RHRLI we’re interested in all things related to hair loss. We have the best available treatment out there for those looking for a permanent solution to hair loss or thinning hair. It’s called the ARTAS® System and it uses advanced robotic technology to create a newer healthier head of hair for our patients. We also want our patients to know information about all issues related to hair loss. So we want to tell you what we know about hair growth and loss in the summer time. Anagen, which is the active phase of hair growth cycle. During this phase, hair grows about 1 centimeter every four weeks. Telogen, this is the resting phase of the hair growth cycle and it lasts about 100 days. About 6 to 8 percent of hair are in this phase at any given time. But is the telogen phase more common in the summer? At least one hair loss doctor thinks it is. Dr. Robert Dornin says that women will see increased hair loss in the summer. “Seasonal hair loss is actually a thing,” he told InStyle Magazine. “Research suggests that women have slightly higher rates of telogen during the month of July. Telogen is known as a resting phase for the hair follicle, which means that the hair is extra prone to shedding and falling out.” Dornin attributes this to the extreme weather of summer but also points out that it’s not a cause for concern. “As hair falls out, hair regrowth is occurring as well,” he said. US News and World Report suggests that when hair is subjected to summer heat, as much as 70 percent of hair follicles can prematurely enter the telogen phase, leading to more hair shedding than usual. According to the website Live Science, researchers also think that hair also grows quicker in the summer. They attribute the increased rate of growth to changes in diet, saying that people eat more fruits and vegetables during the summer season, shifts in hormones and increased exposure to UV radiation. So while it appears women may shed more hair than usual in the summer time, there’s also research that indicates it’s a prime time for hair regrowth. You shouldn’t worry unless you’re seeing severe hair loss or hair loss coming in a pattern. If you do notice that or if you’re concerned about finding a permanent solution for hair loss or thinning hair, Contact RHRLI today and ask about the ARTAS® System.